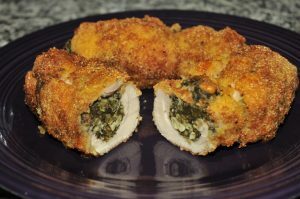 We have been making stuffed chicken roll-ups of various sorts for a number of years. They have been a family favorites, but we keep experimenting, trying new variations on the theme. We started out with chicken breasts and they were stuffed with cheese and sometimes ham or pepperoni. Breading was a triple dip: flour, egg/milk, bread crumbs with herbs and crushed pine nuts. However, while these were good, the breasts often were drier than we would like and I wanted to reduce the amount of oil needed for a crispy crust. So there has been an evolution. Switching from breasts to boneless thighs, moving where herbs and other flavorings would reside (stuffing, base coat/ dredge, wash, crumbs). Each iteration was a bit different. Tonight I pushed it a bit farther and we are really happy with the results. So here is the recipe to the best of my recollection (some day I will write as I cook). 4 boneless skinless chicken thighs (costco). Remove the fat deposits, and butterfly as flat as you can trying for 6×8″ or so. Pound out under plastic wrap to about 3/8″ thick. The chicken will be fragile and have holes – don’t worry. 10-12 oz chopped frozen spinach. Thaw and wring out as hard as you can. Whisk these together and let sit (and whisk again). It should be a very thin batter, like a crepe batter. Note the mix will thicken after sitting a few minutes. Take the very irregular and pounded out chicken thighs and lay out. Place 1/4 of the spinach mixture in a line along the best looking long dimension. Roll up – yes they will have holes and not be pretty at this point. Tie with string in 3-5 places, to make a rough log. Dip and roll in the batter. Then dip and roll in the coating. Set aside to rest for 5-15 minutes (longer is better for adhesion of the coating) . Saute, in a preheated mix of olive oil and bacon grease (about 2 TBSP each) . Place in the pre heated pan and let brown (about 3-4 min) , flip over 180 degrees, and brown again, rotate 90 browning again, and finally flip over. Now drain off the excess grease and then throw the pan in the oven at 325 on convect for about 20-30 min. Cook to internal temp of 175-180. Yes it sounds high, but these are thighs – you would do breasts to 160-165. Pull from oven and let sit 5-10 min and serve. Compared to the regular panko crumb crust, there is about 1/ 2 the absorption of the fat. It is now late summer and we are blessed with an overabundance of tomatoes and peppers. It is always hard to predict how well they will do so we plant 12+ of each. This summer things have gone well with plenty to eat and give away. However, much of the summer has been hot and dry and recently we have had a lot of rain. This causes the tomatoes to split and rot if not picked aggressively. This means we have gallons of tomatoes, Yellow pears, orange and red cherries up through some really nice beef steaks (Romas were a bust). For peppers we have loads of sweet bananas, cubanelas (sweet), jalapenos and a decent number of poblanos. Last weekend we made tomato sauce and this weekend is salsa. Low 70s temp and rainy so it was a perfect day to be in the kitchen. Our oldest daughter Jessie brought up the idea canning of Pineapple – tomato salsa . This sounded interesting but there are few recipes available. However we found one on Taste of Home: http://www.tasteofhome.com/recipes/spicy-pineapple-salsa and modified it slightly. I really have to give credit to my wife Teal. She cleaned and chopped gallons of tomatoes today. On top of it she doesn’t eat tomatoes, salsa or pineapple (unless blended with rum and coconut). We ended up with 29 jars of salsa. Our final version was close to the original but we went for roasting the pineapple and jalapenos as well as draining the pineapple to make it thicker. Final cooled sauce pH test with pH test paper came in at between 3.5 and 4 .well under the 4.6 required for safety. 1 can (15oz) tomato paste. If only there was yellow tomato paste – the color would be better. Mix and cook at a hard boil for 15 min.. Stir frequently. If you want a smoother consistency (as we did ) use a stick / immersion blender to smooth it out near the end of cooking (yes it will clog up but just shake the skins off). Pack into pint jars and boiling water process for 15 min. 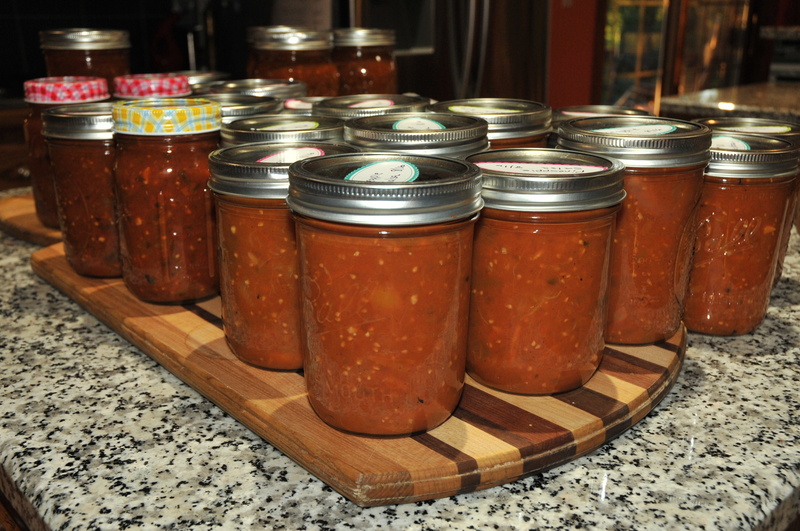 We made a bunch of conventional tomato salsa as well – that recipe will be a subsequent post .